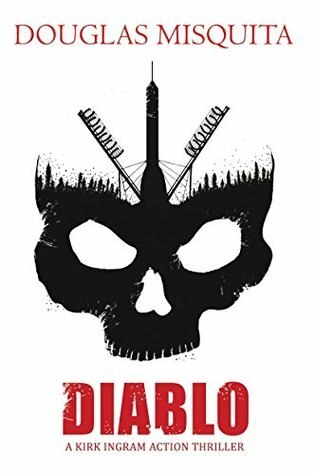 Diablo, by Douglas Misquita, takes you on the next adventure of Haunted famed FBI agent, Kirk Ingram, whose family was murdered before his eyes. Driven by grief, guilt and nightmares, Ingram continues his relentless war against organised crime. The Migrant Crisis threatens the European Union with rising intolerance, disintegration and violence. Driven by disillusionment, revenge, and a lack of faith in existing migration policies, The Council wields a horrific solution to the problem: an ethnic bio-weapon, Diablo. FBI agent, Kirk Ingram stumbles upon their heinous scheme and is in a race against the clock to stop the genocide. But when Diablo is seized by the United States, Ingram must join forces with The Council to prevent an even greater atrocity from being unleashed upon the world. Diablo, by Douglas Misquita, deals with the very real and very current global immigrant crisis and genocide problem. While on the one hand, there are armored vehicles, modern weaponry, and futuristic technology (bio-genetics, space programs, artificial intelligence), on the other, the author portrays, with equal authenticity, the inhumane horror and suffering experienced by natives of a war-torn nation, fleeing in search of a better life, leaving behind everything familiar, everything they've ever possessed. You also get to see the other side of this immigrant crisis - the socio-economic problems created by illegal migrants in the host countries, and the resultant fear they generate among the natives of those countries. The way Misquita has covered this from so many angles, shows that he's not just an "action writer" any more. Yes, he can describe his weapons and choreograph jaw-dropping action sequences, but he can also get into his characters' minds now. The book speaks of research into places, current socio-political events, artillery, technology, and also human psychology now. So another step in the right direction. Diablo is much slower paced than Misquita's earlier novels, especially in the first half, but it is so much more violent and hard-hitting. The plight of the immigrants makes you squirm in anger at the helplessness and injustice of it all. The fights have become nastier and bloodier, and, at the same time, a lot more creative with the use of advanced technologies like artificial intelligence. The character sketches are gaining depth and are becoming more relatable. Misquita attempted adding a bit of humour this time, but that didn't come out as confidently as the rest of his writing. His narrations read like a pro's work, but the dialogues seemed amateurish. Also, some of the details in the narration were too technical and went over my head. So I couldn't visualize those scenes as vividly as the rest of the book. Diablo maintains its suspense right till the end though. The climax was totally unexpected and exceptionally strong. Being a fan of English action movies, I have seen so many explosions on screen. But the one Misquita creates at the end of Diablo beats them all. An extra half star just for that! My rating: 4 out of 5. Diablo, by Douglas Misquita, is yet another episode of myriad of characters, from varying social and geographic backgrounds, astutely interwoven together, into a gripping action thriller. This post was long overdue. It's the one where I tell you how I got locked in the bathroom at my best friend's wedding. That's right. It really did happen. I'm not making it up. 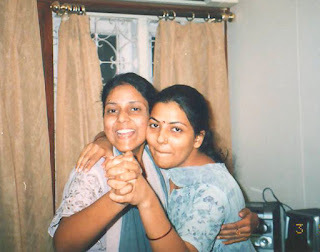 But before I go into that story, let me first tell you a little bit about my old school-time bestie. 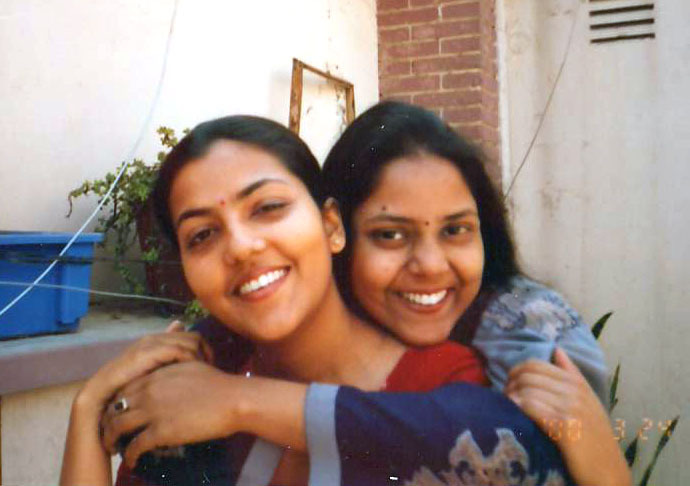 That's Swati (the one in the front) and me, more than 16 years ago. What exactly are we doing in this pic? No idea. By the way, the SRK & Bobby behind us belong to my sister. In her circles, she is well-known for walking into medicine shops to buy a loaf of bread! And for sporting a bright-green contact-lens, in just one single eye (the other being normal), on Holi. And then smiling back at strangers who stare at her, believing they find her exceptionally beautiful that day! And also for her messy cupboards, that I had to organize whenever I visited her. 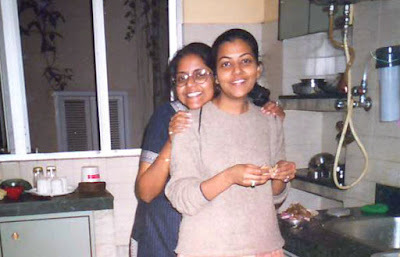 She once even called me up from Bangalore (after her marriage), when I lived in Patna, saying her cupboard was a mess, so I should come over! From Patna. To Bangalore. Just to organize the stuff in her cupboards. I really wish though that she didn't stay so far away. This was the day when her parents were out of town and we had an all-girls' slumber party at her place. Anyway, her wedding was naturally a big deal for me. Best friend's weddings usually are, for most people. I had to help her with the shopping and the gift packing, and all kinds of miscellaneous wedding chores, you know. So I was the first one to arrive at her place, days before the wedding. And that's when the "catastrophe" happened. The bedrooms were all on the upper floor, while the living area and the kitchen were downstairs. The dreaded bathroom (where I got locked) was on the upper floor, and had two doors - one from the bedroom, and one from the passage outside, that led to the stairs. Anyone familiar with a typical North-Indian wedding will know of the custom where all the wedding gifts, lavishly packed on Styrofoam sheets, are displayed to visiting relatives. That bedroom was being used for that purpose. So it was kept locked when Swati's parents were not in it. The bathroom door from that room was also locked. We were told to use the other door to get in and out of the bathroom. Somebody apparently forgot these instructions though! One fine morning, there I was, having a shower in that bathroom. When I was done with my shower, I realized, to my utter dismay, that the door wouldn't open. The other door was obviously still locked from the outside. I did what most people do when they get locked in the bathroom. I shouted. And I banged on the door. But here's the worst part... there was nobody else on that floor that time who could hear my shouts! They were all enjoying the delicious calorie-rich wedding-breakfast downstairs! I have no idea how long I had to wait in that stupid bathroom before I heard footsteps on the stairs. Somebody was coming up. I resumed my shouting and banging. Finally, they let me out! Uffffffff! Needless to say, I was the biggest joke of the day! "Kaddu, you got locked in the bathroom today!!! [Guffaws]"
"Kaddu, how did you get locked in the bathroom today? [Giggles]"
"Kaddu, who the hell locked you in the bathroom today? [Chuckles]"
Swati and me, days before her wedding. Sigghhhhh! One of my life's biggest bragging rights... "I got locked in the bathroom at my best friend's wedding"! No really! How many people in the world can boast about that? What about you? 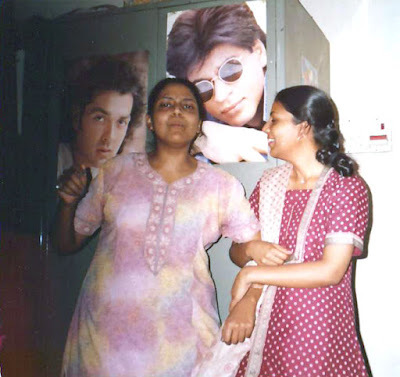 Do you have any such crazy stories with your besties? If you do, then now is the perfect time to share them, because ZEE TV is bringing a new fun-filled chat show, called 'Yaaron Ki Baraat', that will put celebrity friendships to test through a series of fun challenges and tasks. I wonder which celebrities are going to participate in the show. It will surely be a riot of entertainment and fun. Best friends on national TV! I am totally looking forward to the first episode on 8th October (that's tomorrow) at 8pm.